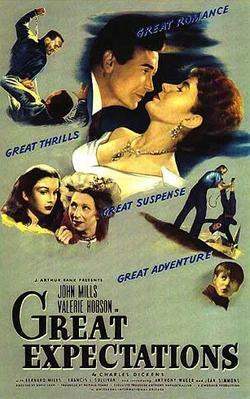 “Great expectations” poster. Licensed under Fair use via Wikipedia. For all its critical plaudits, David Lean’s adaptation of Great Expectations ends on what can at best be called a ludicrous note for readers focused on an adaptation’s fidelity to its text. [i] In its published ending, the novel concludes years later with a mature and chastened Pip encountering a similarly mature and chastened Estella in the open ruins of what was once Satis House. Estella has endured a brutal marriage to the now-deceased Drummle, and Pip a life of clerical work in the east in Clarriker’s house. Estella describes her altered perception of life with phrases that Dickens retained in the published ending from his draft—“suffering had been stronger than all other [in draft: Miss Havisham’s] teaching, and has taught me to understand what your heart used to be” (3.20, 484). It is the conjunction of time, suffering, and reflection that connects these characters in the published ending’s rising mists of a new day. By contrast, Lean’s film ends shortly after Magwitch’s death, with Pip’s discovery of Biddy’s marriage to Joe followed closely thereafter by his return to a still-standing Satis House. Inside, Estella sits in Miss Havisham’s vacant seat, abandoned at the altar by Drummle because of her low parentage—a fact never revealed to her in the novel—but newly enriched not only by Miss Havisham’s death but also by that of Magwitch, as the Crown has apportioned his property to her. Pip implores Estella to abandon her decision to embrace not only Miss Havisham’s ideology but also her position in Satis House, and pulls down the dusty drapes to let in the sunlight. This melodramatic turn has immediate effect: Estella embraces Pip, and the two depart Satis House to marry and enjoy Estella’s wealth. A close reading of Lean’s ending can be particularly useful in teaching the novel. First and foremost, the divergence from the text—easily spotted by students—can be used to start a discussion about the novel’s central themes and values, most especially its focus on disinterest and selflessness (e.g., Pip’s request that Miss Havisham fund Herbert Pocket’s partnership and refusal of her offers of financial assistance) and its insistence on the power of suffering to build character over time. Some students will, of course, embrace Lean’s ending, and here too one can highlight what values and desires readers bring to texts, and the ways in which Dickens’s novel uses their desire to, in Peter Brooks’s language, read for the plot in order to manipulate their reactions. Second, the Lean ending also reveals how authors and directors create a sense of unity and wholeness by returning to prior parts of a text. For Lean, the textual justification for his ending appears to be a line from Pip’s first encounter with Miss Havisham: “I have often thought since, that she must have looked as if the admission of the natural light of day would have struck her to dust” (1.8, 60). Pip’s shout to Estella in Lean’s film reiterates this idea (“I have come back Miss Havisham to let in the sunlight”),[ii] and the intrusion of sunlight in the frame signals a radical alteration of perspective from the film’s gray opening on the marshes. Several scholars have discussed the endings to Great Expectations. Peter Brooks argues in favor of the draft ending while Hillary Schor reframes the apparent romance plot of the film adaptation by focusing on Pip’s desires. For discussions of the novel’s thematics, see Julian Moynahan, and F.R. and Q.D. Leavis. For discussions of Lean’s success as an adapter, see Brian McFarlane. In sum, an examination of divergences in the adaptation of the novel’s conclusion can underscore how Great Expectations reveals a key tension in the construction of any narrative conclusion between thematic consistency and aesthetic unity. Dickens wrote two endings for the novel, the second at the urging of Sir Edward Bulwer Lytton. Read his draft and published endings (the Norton Critical and Broadview editions contain useful extracts from Dickens’s letters on the change). How do these endings highlight or downplay different themes? Which themes do Lean’s ending bring out? Which themes are underplayed? In the published ending, Dickens returns to the image of rising mist. Examine the novel’s prior instances of this image (e.g., at the end of the first stage of Pip’s expectations [1.19, 160], during Pip’s discussion of Estella with Herbert [2.11, 250], and with the evaporation of his expectations [3.18, 470]). How does the published ending use this imagery? How does Lean’s ending respond to it? In Reading for the Plot, Peter Brooks argues in favor of the draft ending because it shows Pip has overcome his attraction to Estella and his tendency to misread the world, while the published ending seems to restart Pip’s obsessions. Do you prefer one of the endings? Why? How do you want the novel to end? Do Dickens’s endings fulfill those desires? Does Lean’s? What do the different endings imply about what we as readers bring to a text? And what does the experience of reading multiple endings do to your interpretation of the novel? Lean’s film was released in 1946, just after World War II. The German aerial bombardment of Britain led to the widespread use of blackout curtains to prevent night time lights from guiding planes to bomb targets. How might that historical context inform our interpretation of Lean’s choice of an ending? Brooks, Peter. Reading for the Plot: Design and Intention in Narrative. Cambridge, Mass. : Harvard University Press, 1984. Dickens, Charles. Great Expectations. 1860-1. Ed. Charlotte Mitchell. New York: Penguin Classics, 1996. Great Expectations. Dir. David Lean. 1946. Criterion Collection, 1998. Leavis, F.R., & Q.D. Leavis, Dickens: The Novelist. New York: Pantheon, 1970. McFarlane, Brian. “David Lean’s Great Expectations—Meeting Two Challenges.” Literature and Film Quarterly 20.1 (1992): 68-76. Moynahan, Julian. “The Hero’s Guilt: The Case of Great Expectations.” Essays in Criticism 10 (1960): 60-79. Schor, Hillary. Dickens and the Daughter of the House. Cambridge: Cambridge University Press, 1999. [i] The sequence occupies two chapters on the Criterion Collection DVD reissue of the film, and runs from 01:52:40-01:57:45. McFarlane offers a useful instance of the film’s critical celebration. Follow Streaky Bacon on Twitter! Streaky Bacon by http://www.streakybacon.net is licensed under a Creative Commons Attribution 4.0 International License.